1. Though Abu and Rajah serve as the best animal friends to lead characters Aladdin and Jasmine, they do not appear – nor are referenced – in the stage show production at Disney California Adventure Park. 3. In Aladdin and the King of Thieves, Genie makes reference to a boatload of Disney characters, including Chief Powhatan’s famous daughter, as seen in this clipat about the 1:07 mark. 4. Jafar has a fraternal twin sister, a sorceress named Nasira. 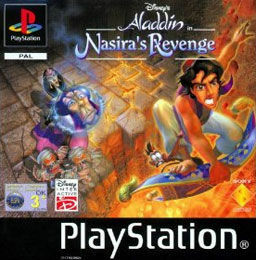 She serves as the villain for the Aladdin-themed video game, “Disney’s Aladdin in Nasira’s Revenge.” Nasira is voiced by none other than Ariel the Little Mermaid herself, actress Jodi Benson. 5. When the film was first released on VHS in 1993, Aladdin sold a whopping 25 million copies. 7. In an early version of Aladdin, the protagonist was to have a mother. Thus, the Howard Ashman-Alan Menken song called “Proud of Your Boy” was scrapped. However the song is featured in a Clay Aiken-sung music video, highlighted on the 2004 DVD. 8. Dan Castellaneta, the voice of Homer Simpson, brought Genie to life in The Return of Jafar, after Robin Williamsexperienced a temporary falling-out with The Walt Disney Company. Castellaneta recorded all of his dialogue as Genie forAladdin and the King of Thieves, but once Williams returned to the role, his voice-work was removed. 9. 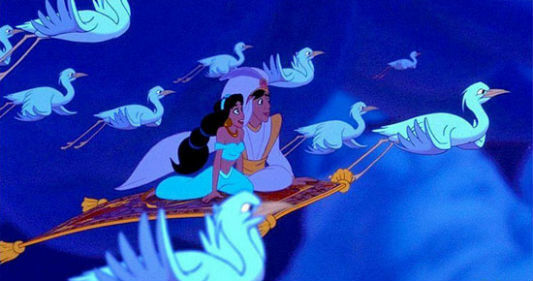 Princess Jasmine, descending from Arabian heritage, was the first non-Caucasian Disney princess. 10. Aladdin earned over $500 million worldwide during its theatrical release and was the highest-grossing domestic film of 1992. 11. Aladdin boasts an entire section of Tokyo DisneySea, “Arabian Coast,” its design influenced by the environments of India and the Middle East. 12. 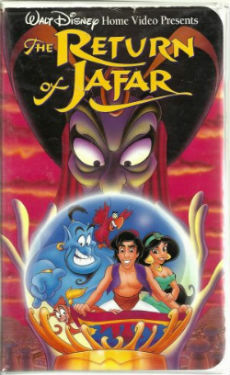 The Return of Jafar was the first Disney direct-to-video animated feature, released in 1994. This launched a new platform for Disney, allowing them to utilize their characters in even more features. 13. The characters from the Aladdin television series guest-starred on an episode of the late-’90s Hercules animated series. 14. Following Disney’s precedent in re-releasing Beauty and the Beast and The Lion King in the IMAX format, Aladdin was scheduled to return to theaters in that format. Yet that re-release was canceled, even though a trailer had already been shown to IMAX audiences. 15. Aladdin’s appearance was originally modeled after actor Michael J. Fox, though movie-star Tom Cruise and even rapper MC Hammer later served as inspirations. 16. The Beast from the 1991 animated feature makes a “cameo appearance” in Aladdin, in the form of a figurine that the Sultan plays with, along with a whole stack of animals. 17. According to a Travel Channel special that explored the Disneyland Resort and the making of “Aladdin: A Musical Spectacular,” the actor who plays the Genie must go through over an hour-and-a-half of prosthetic, make-up, and other processes to transform into the blue comedic force. 18. 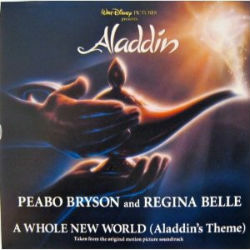 The pop version of “A Whole New World” by Peabo Bryson and Regina Belle topped the Billboard Hot 100 chart on March 6, 1993. This is the only song from a Disney animated feature to claim that number one honor. 19. In Disneyland’s “it’s a small world,” characters from Aladdin, designed to fit the style of the scene, hover on the Magic Carpet. 20. Both Lea Salonga (Jasmine’s singing voice) and Linda Larkin (Jasmine’s speaking voice) were honored with Disney Legend awards at the 2011 ceremony, held at the D23 Expo, as seen in the clips below. Agrabah aficionados, I encourage you to share your favorite moments and memories of Aladdin. Share your comments below and tweet your thoughts. If Genie granted you three wishes, what would you use them toward? I think having a buddy like Genie or Carpet would be a solid call.